What’s in store for The Split? SundanceTV just announced the TV show has begun production on its second season. The drama series, which airs on BBC One in the U.K., centers on the Defoe women, whose law firm is at the center of the city’s divorce circuit. The cast includes Nicola Walker, Annabel Scholey, Deborah Findlay, Anthony Head, Rudi Dharmalingam, Stephen Mangan, Meera Syal, Fiona Button, Barry Atsma, and Stephen Tompkinson. 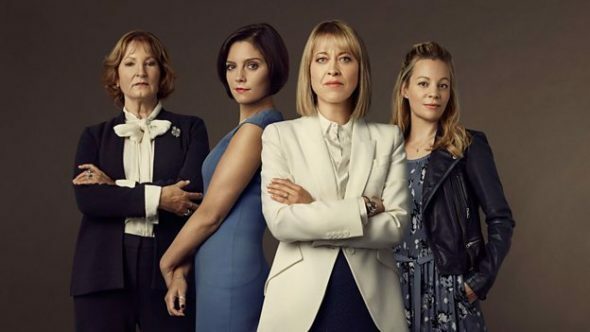 NEW YORK – March 21, 2019 – BBC One and SundanceTV announced today that production has started in London on season two of the original series The Split, helmed by BAFTA and Emmy(R) Award-winning writer Abi Morgan (River, Suffragette, The Hour) and executive producer Jane Featherstone (Broadchurch, River, Humans). The series’ second season stars Nicola Walker (River, Last Tango In Halifax), Stephen Mangan (Episodes), Deborah Findlay (Leaving), Fiona Button (Lip Service), Annabel Scholey (Being Human), Rudi Dharmalingam (Our Girl) and Barry Atsma (Hector And The Search For Happiness) with Donna Air (Hotel Babylon) and Ben Bailey Smith (Cleaning Up, Doctor Who) joining the cast in season two. Set in the fast-paced, messy world of London’s high-end divorce circuit, The Split is an authentic, multi-layered, witty examination of modern marriage and the legacy of divorce. Exploring the often-complex realities that bind families together, and tear them apart, the series follows the three Defoe sisters, Hannah (Walker), Nina (Scholey) and Rose (Button) and their formidable mother Ruth (Findlay). At the end of the first season, Hannah’s formally rock-solid marriage was beginning to crack following the devastating revelation of Nathan’s (Mangan) affair. For the rest of the family, and Hannah, joy had turned to tragedy as estranged father Oscar (Anthony Head) passed away the night of Rose and James’ (Dharmalingam) wedding. Struggling with the grief of losing her father for the second time in her life and with Christie (Atsma) having made his feelings for her clear, Hannah was torn between her past and the promise of a different future. Now the Defoes are back, at newly merged law firm Noble Hale Defoe, and as former rivals now find themselves on the same side of the table, Hannah’s latest case is set to put NHD firmly on the map. Locked into an aggressive NDA by her controlling husband Richie Hansen (Bailey Smith) when she was young and naive, Fi Hansen (Air), one half of the UK’s most powerful celebrity couples, now wants out of her marriage. Hiring Hannah to help prepare to leave her dangerously coercive and manipulative partner, their divorce is set to be all the things the press love: public and messy. As the curtain is pulled back from the glossy veneer of their meticulously constructed public image, the pain that lies behind Brand Hansen is slowly revealed and Hannah must invest more than just her billable hours in helping Fi reclaim her life. Meanwhile, Rose and James return from their honeymoon with ambitions to start their own family and Nina teeters on the edge, as the consequences of her erratic behavior finally catch up with her. With the merger now complete, Ruth forced out from her role as head of the family firm, must search for a new purpose in life. And, as Hannah fights one of the most public cases of her professional career, the fight to save her own marriage is a deep, intensely, private battle. Conducting a passionate affair with Christie, Hannah feels trapped; struggling to forgive Nathan, whilst ridden with guilt about her own infidelity. As they reach a milestone wedding anniversary, Hannah must decide. Will she take a course which could result in the end of her marriage, or can she in fact have it all? Created and written by Morgan, The Split is produced by Sister Pictures for BBC One, co-produced with SundanceTV, and was re-commissioned by Piers Wenger, Controller of BBC Drama, and Charlotte Moore, Director of BBC Content. Season two is executive produced by Featherstone, Morgan, Lucy Dyke (Black Mirror, Ripper Street) and Lucy Richer for the BBC. Paula van der Oest directs with Natasha Romaniuk producing. What do you think? Have you seen The Split? Will you watch season two? More about: BBC One TV shows: canceled or renewed?, SundanceTV TV shows: canceled or renewed?, The Split, The Split: canceled or renewed? The Split on SundanceTV: Cancelled or Renewed for Season Two? Love The Split – have watched Season 1 on Amazon Prime many times. Outstanding series. So glad There’s a Season 2.